Rehabilitation of complicated cases poses difficulty in clinical practice, both with respect to restoring function and with esthetics. One such clinical condition where the dentist has to give importance to proper planning of the treatment and execution of the plan is amelogenesis imperfecta (AI), a condition where both function and esthetics are accommodated. This article discusses both the functional and esthetic rehabilitation of a patient with AI. 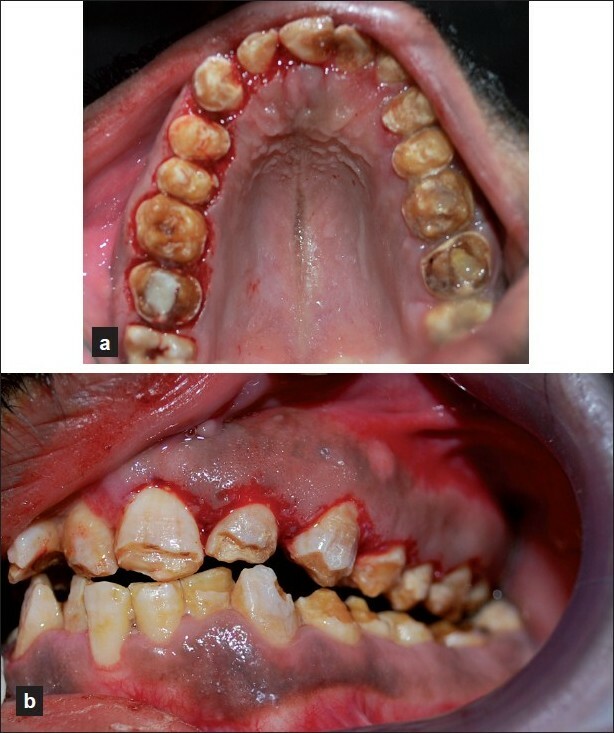 Both the esthetics and function were hampered in this patient due to the condition. As a result, the treatment was properly planned and executed. A number of treatment options are available for us today to treat such a case. There is no one technique to be followed as such. However, the aim was to properly diagnose the case and provide good function and esthetics to the patient. There are a number of symptoms, which include the following. Also, the radiographic examination usually shows a full complement of teeth, but the crowns of the teeth have very thin enamel or lack enamel completely. 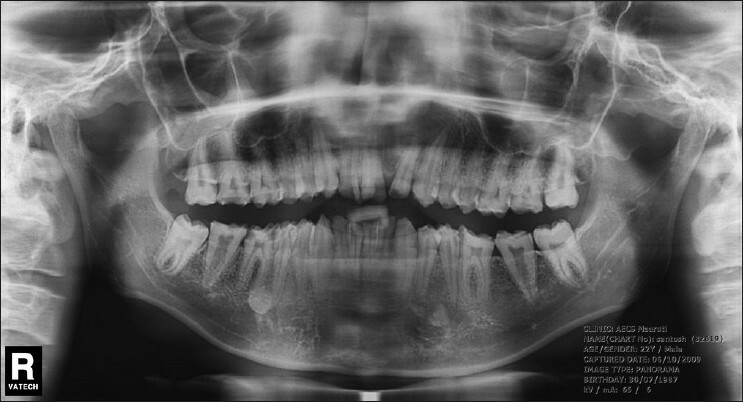 A 22-year-old male patient presented with the chief complaint of considerable sensitivity of his teeth, difficulty in chewing, and displeasure with his present dental appearance. A detailed medical, dental, and social history was obtained. 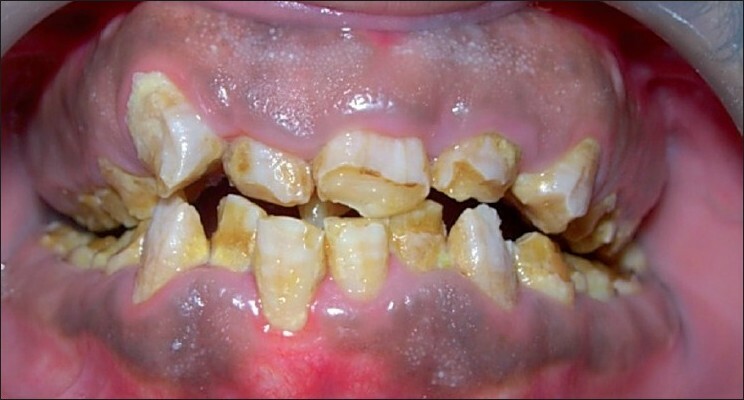 The enamel of all the teeth was hypoplastic and yellow brown in color. The surfaces of the teeth were rough, and the enamel was either not visible or very thin over the crowns of all the teeth. The dentin, where it was exposed, was brown [Figure 1]. Examination revealed a midline discrepancy, due to missing 21. A mesiodens was present between 11 and 21. There was definite loss of vertical dimension because the molars were highly demineralized. The diagnosis of AI was made through the extraction of the mesiodens, which was later kept under observation for the procedure of decalcification in the Department of Oral Pathology, AECS Maaruti College of Dental Sciences and Research Centre, Bangalore. The gingival status of the patient was evaluated and we noticed a thick gingival biotype. Pseudoperiodontal pockets were also present. Complete maxillary and mandibular impressions were made and diagnostic casts were obtained. Preoperative intraoral photographs and radiographs were also obtained [Figure 2]. Once these were done, the complete treatment plan was explained to the patient. All factors, including the amount of tooth structure removal, soft tissue surgery, need for endodontic therapy, expected clinical longevity, and duration of treatment were discussed with the patient and a duly signed consent was obtained. In the first phase of treatment, oral prophylaxis was performed followed by a thorough root planing. In the second phase, endodontic treatment was performed on the required teeth. In the third phase of treatment, the periodontal surgery was designed. Once the case was prepared, the surgery was planned and a gingivectomy procedure (external bevel incision) was done as the length of the clinical crowns of almost all teeth were short, and the length had to be increased. Before the surgery, surgical templates were obtained for the patient, from the Department of Prosthodontics, AECS Maaruti College of Dental Sciences and Research Centre, Bangalore. The templates acted as a guide for us to carry out the surgical procedure  [Figure 3]. The surgery was planned in such a way that there was no compromise done regarding the biological width. The surgical procedure was completed in a span of 4 weeks [Figure 4]. Once the surgery was completed, the patient was given postsurgical instructions and oral hygiene was reinforced. We waited for about 4-6 weeks for the healing to take place, after which, the patient was referred to the Prosthetic Department, who took care of the crowns, etc [Figure 5]. After the final step, the patient was instructed and counseled to maintain his oral hygiene by proper brushing and dental check up once in at least 6 months. In order to avoid pathologic changes and to predict treatment results more precisely, it is necessary to keep gingival biological width unaltered during teeth restoration. If there is less than 2 mm distance from restoration's margin to marginal bone clinical crown lengthening possibility should be considered in dental treatment plan. The choice depends on the relationship of crown-root-alveolar bone and esthetic expectations. The clinical tooth crown could be lengthened surgically or by combining the methods of orthodontic eruption and surgery. This clinical report describes a treatment sequence based on an interdisciplinary approach. The treatment is usually combined to meet the biological, restorative, and esthetic requirements imposed by short clinical crowns. This technique is generally used to improve esthetics and takes the form of a gingivectomy, to excise the soft tissue. Normally, the gingival margin is 1 mm coronal to the cementoenamel junction. If it is greater, then the clinical crown is shorter than the anatomical crown. In thin tissue biotypes, a gingivectomy will expose more of the crown and improve the appearance. It may be achieved with a scalpel, or with the use of electrosurgery. The complexity of the management of patients with AI supports the suggestion that the dental profession should have appropriate methods for the rehabilitation of rare dental disorders. The treatment of patients with AI should start with early diagnosis and intervention to prevent later restorative problems. 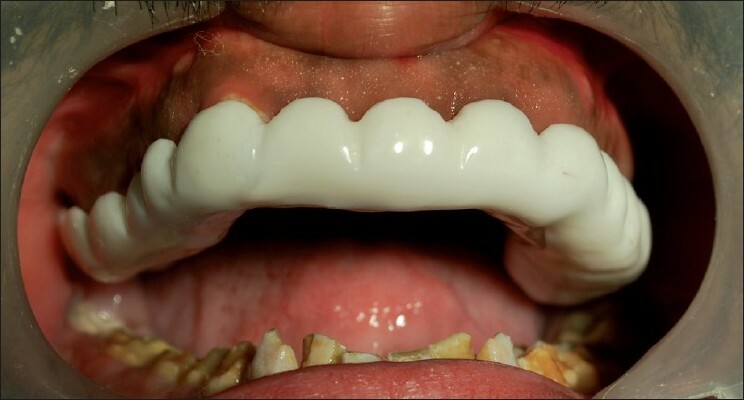 This case report describes the functional and esthetic rehabilitation of AI with porcelain-fused-to-metal crowns. 1. Witkop CJ Jr. Amelogenesis imperfecta, dentinogenesis imperfect and dentin dysplasia revisited: Problems in classification. J Oral Pathol 1988;17:547-53. 2. Aldred MJ, Crawford PJ. Amelogenesis imperfecta: Towards a new classification. Oral Dis 1995;1:2-5. 3. Backman B, Holmgren G. Amelogenesis imperfecta: A genetic study. Hum Hered 1988;38:189-206. 4. Aldred MJ, Savarirayan R, Crawford PJ. Amelogenesis imperfecta: A classification and catalogue for the 21st century (review). Oral Dis 2003;9:19-23. 5. Backman B. Inherited enamel defects. Ciba Found Symp 1997;205:175-82. 6. Chosack A, Eindelman E, Wisotski I, Cohen T. Amelogenesis imperfecta among Israeli Jews and the description of a new type of local hypoplastic autosomal recessive amelogenesis imperfecta. Oral Surg Oral Med Oral Pathol Oral Radiol Endod 1979;47:148-56. 7. Nusier M, Yassin O, Hart TC, Samini A, Wright JT. Phenotypic diversity and revision of the nomenclature for autosomal recessive amelogenesis imperfecta. Oral Surg Oral Med Oral Pathol Oral Radiol Endod 2004;97:220-30. 8. Walker M, Hansen P. Template for surgical crown lengthening: Fabrication technique. J Prosthodont 1998;7:265-7. 9. Silness J. Fixed prosthodontics and periodontal health. Dent Clin North Am 1980;24:317-39. 10. Flores-de-Jacoby L, Zafiropoulos GG, Ciancio S. The effect of crown margin location on plaque and periodontal health. Int J Periodontics Restorative Dent 1989;9:197-205. 11. Planciunas L, Puriene A, Mackeviciene G. Surgical lengthening of the clinical tooth crown. Stomatologija 2006;8:88-95. 12. Gargiulo AW, Wentz F, Orban B. Dimensions and relations of the dentogingival junction in humans. J Periodontol 1961;32:261-7. 13. Padbury A Jr, Eber R, Wang HL. Interactions between the gingiva and the margin of restorations. J Clin Periodontol 2003;30:379-85. 14. Ozturk N, Sari Z, Ozturk B. 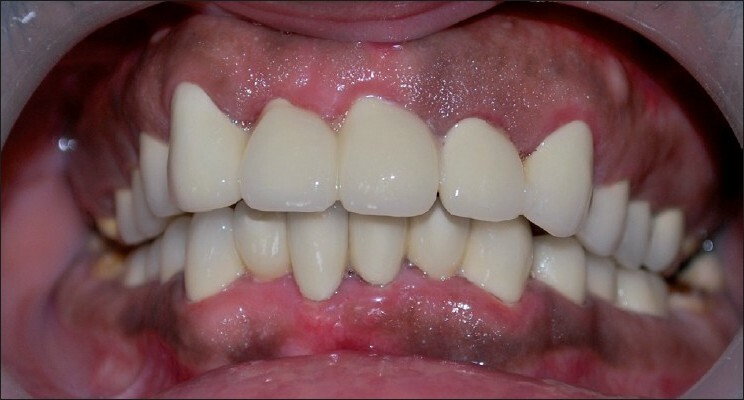 An interdisciplinary approach for restoring function and esthetics in a patient with amelogenesis imperfect and malocclusion: A clinical report. J Prosthet Dent 2004;92:112-5. 15. Huynh-Ba G, Bragger U, Lang NP, lengthng of the clinical crown: A periodontal concept for reconstructive dentistry. Periodontol 2ooo 2007;4:193-201.